The year is about to end and it is a good idea to try and stay away from financial traps before 2018 bids us farewell. Falling into one of the traps will forfeit all the hard work you have put in throughout the year. A few wrong financial moves can put you back to square one and push you further away from achieving your goals. The last thing you want to do is make a mistake that puts you at a financial disadvantage once the new year begins. You do not want to start 2019 with a lot of frustration because you committed a last-minute mistake last year. When we reach the end of the year, our spending changes. The holiday season prompts us to spend more than what we used to. We buy gifts, schedule travels, organize parties, change the decorations at home – all of these will cause you to increase your budget. If you are not careful, the holiday festivities might end up compromising your financial position. So what are these financial traps that you need to avoid so you can end this year properly? Here are the most prominent ones. A recent report shares that over 80% of Americans gave in to impulsive shopping leading to over $17B in spending. If you happen to pair this impulsive buying behavior with a big ticket item, you are headed for trouble. It is never a good idea to make big purchases on a whim. Even if you have the money to pay for it, you should always pause before buying anything expensive. It is not just to make sure that you really need it. You need to think about your budget and where you can get it for the best price. You need to allow enough time for you to compare prices – making sure that you get the best value for your money. It is very easy to lose yourself to the shopping culture when the holiday season starts. However, you need to control your spending urges – especially when you plan to use your credit card for your purchases. This does not mean you should not use your card. It is okay to use your credit card especially if you will earn points and rewards from it. However, you still need to plan how you will use it. Make a list of the things that you need to buy using your credit card. Stick only to this list. Take note of how much you have swiped and calculate how much you need to pay. If possible, pay the balance in full so you no longer have to worry about the interest. Among the financial traps that you should also avoid is adding to your monthly expenses. If you barely have anything left of your income after your monthly bills are paid, you need to make sure your holiday spending will not increase your monthly expenses. This is especially true if you are using your credit cards to pay for your purchases. Either you pay it all in full or you don’t spend at all. You will just put a strain on your monthly budget and that can make the start of the new year quite unpleasant. You do not want to suffer during the first few months of next year just because your budget is struggling with so many payment obligations. What happens when you do commit these financial mistakes? Now that you know what the financial traps are, you need to make sure that you avoid them. You do not want these financial mistakes to follow you until next year. In case you fall through any of these traps, you need to act on them immediately. If not, you might end up suffering any of the following. The first obvious effect will be on your finances. You will compromise your financial situation and that is never a good way to start the new year. If you do not have a strong financial position, to begin with, this can make things more dangerous. Make sure you aim to finish the year strong because that will help you set off towards a stronger financial position. With stronger finances, you have more resources to work with as you set new goals and try to reach them next year. Another effect of financial traps is on your financial goals. Most of the time, these traps will cause you to fall into debt. That means you will end up using your extra money to pay for it instead of using it to reach your goals. The debt payments could have been used to increase your retirement fund or for the down payment of your new house. Try to minimize making financial mistakes so you do not have to compromise the progress of your financial goals. Finally, financial traps can also make it very difficult to face emergency situations. Since life is very unpredictable, you can expect that unexpected situations will happen every now and then. You need to be prepared for these – but how can you do that if you are still trying to get out of the trap that you fell into before the year ended? Unfortunately, reports reveal that consumers are not bothered that they do not have an emergency fund saved. This complacency is bad for your financial security. You need to make sure that you are prepared for emergencies. This is done, not just by saving up for it, but also by making sure you do not fall into any financial trap. 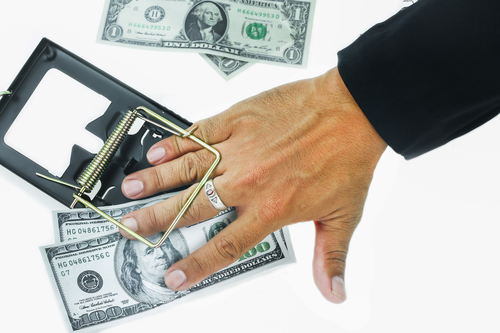 Now that you understand the effects of financial traps, what can you do to stay away from it? Here are a couple of tips that you can follow. You can start by staying away from spending triggers. There are times when it is acceptable to spend more than your budget, but this comes with a lot of rules and restrictions. If you know that you should not be spending, do not put yourself near temptations that will make you spend. This is a simple concept but it can be hard to control especially during the holiday season – but you really have no choice. If you want to avoid spending triggers, you need to make sure that you plan your spending. The truth is, you cannot avoid spending during the holiday season. But you can avoid the financial traps as long as you plan your expenses carefully. Whatever you include in your plans should be followed strictly. If you created a list, make sure you stick to it. According to reports, Americans have trouble sticking to their budgets. It is true that it can be very hard but you need to learn how to curb your spending urges. It is important for you to stick to your budget because it will help you stay in control of your finances.